Inspired by Art Deco design, this dazzling diamond engagement ring is a whisper of old India to wear proudly upon your finger. The abstract shapes of Art Deco have a rich history in India, and Bombay is a rich source of inspiration for this kind of architecture. Our designers were inspired by art, landscapes, history and architecture to create a series of signature Indian engagement rings. You can celebrate the culture of Jaipur, the royals of Delhi, and now the Indian tour continues with a visual feast in Bombay. Here you will find the world’s second-biggest collection of Art Deco architecture. Bold shapes, global influences, and a sense of grandeur characterise this kind of design. The Art Deco look is distinctive and timeless: a characterful style that’s quite different from usual engagement ring designs, and perfect if you’re looking for a culturally authentic and visually arresting platinum ring. PureJewels specialises in Indian diamond engagement rings. We’re proud to serve couples and their families, and welcome you to the store if you’d like to inspect the rings in person. Please use our website to make an online booking or telephone and arrange an appointment. 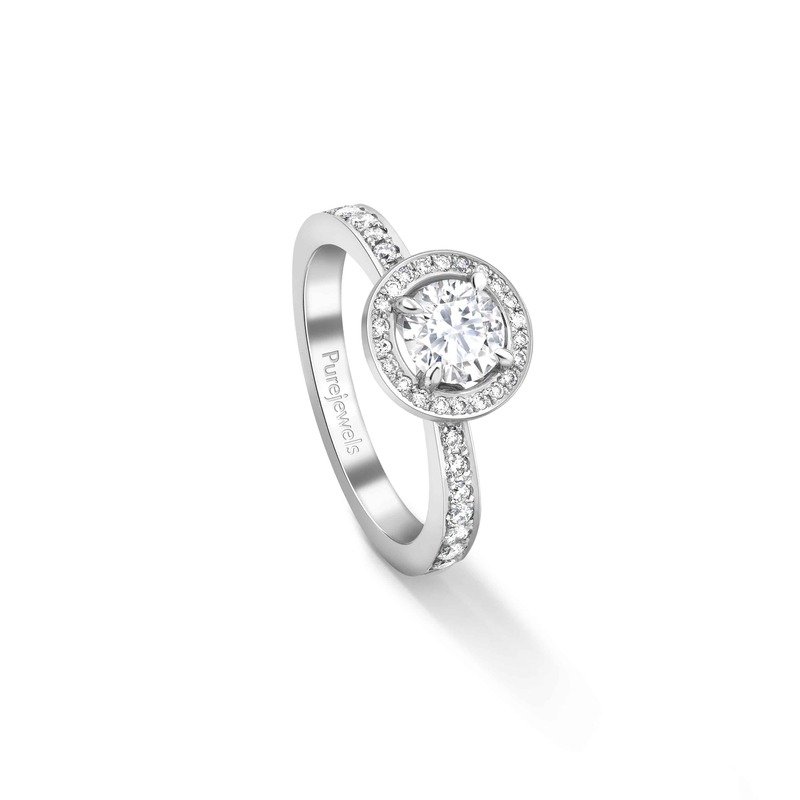 ‘Halo’ refers to the ring of pavé diamonds arranged around the central diamond. It beautifully highlights the main stone and increases the sparkle, with more facets to produce more tiny beams of light across the surface. You can custom-order this ring by specifying the size, colour and clarity of diamond that you would prefer. When you order it, your Bombay Deco Halo ring will be individually handmade, using a stone that has been carefully selected at PureJewels. Our diamonds are naturally and ethically sourced. Every stone of 0.30ct and above will arrive with a certificate from the GIA, the American institute that is famed for its stringent testing. Our stones begin at one of the world’s top five cutting centres, in India, where they are beautifully cut to reveal their inner fire. Once you have made an order, according to your budget and preference, we will choose the finest diamond that meets those specifications. Besides the four Cs, our master jeweller will look for character and fire. That’s the illuminating sparkle emitted by the really good diamonds! It’s what turns a beautiful engagement ring into a breathtaking engagement ring.